Alan J Lawson is an Anglo Hispanic painter and poet living in the Swiss mountains. Alan works from nature, often spending months painting the same subject both in the studio and in the remote woods where he lives. Alan’s technique is inspired by Rembrandt whom he believes to be ‘the greatest artist of all times’. His work stems between the direct contemplation of nature and his internal poetic life: ‘What I cannot express in paint I attempt in words, and vice versa’. In 2014 Alan was shortlisted for the Bridport Poetry Prize by the renowned poet Liz Lochhead. Lawson is the co Founder and co Director of the Alpine Fellowship, a non profit symposium for artists, philosophers, and poets. Professor Roger Scruton, whom Alan painted in 2011, is the ambassador. The 2014 fellowship was covered by the Financial Times. Alan is one of the key figures in the revival of representational art and his essay ‘Redemptive Realism’ was published as part of the TRAC proceedings by the California Lutheran University. His work and philosophy is covered by Fine Art Connoisseur magazine (May 2015) as part of the contemporary masters series. Alan's painting has been internationally recognized by the Portrait Society of America, and The Art Renewal Center, and his work is widely collected in Europe and the United States, where he has significant patronage and collectors. In addition to his finished studio works, he is also a prodigious painter of plein air subjects and spends his summers painting on the Italian riviera, ‘these are the visual journal of my travels’. Alan paints and writes in the remote mountains of Switzerland where he lives with his wife and son. He welcomes studio visits by appointment. 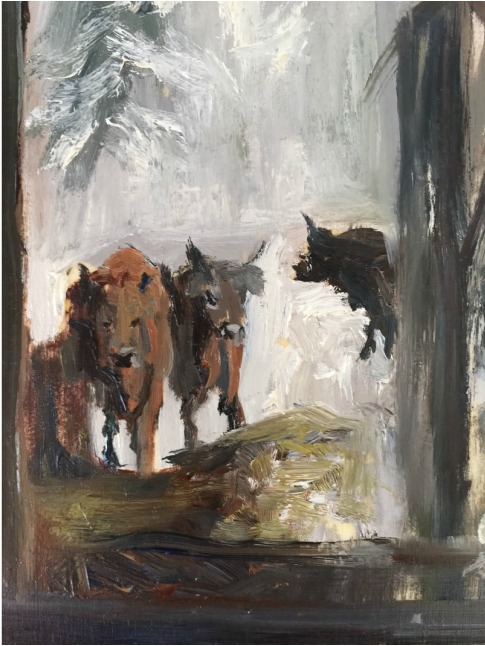 "Cows in the Winter Barn"